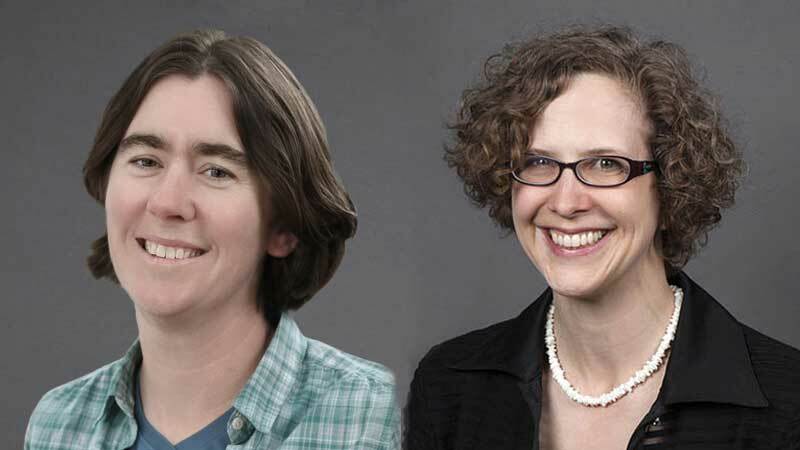 UO faculty members Samantha Hopkins and Julie Voelker-Morris have been selected as 2017-18 Williams Fellows for their commitment to undergraduate education. The Williams Fund for Undergraduate Education, through its Williams Council, also awarded seven instructional grants. Hopkins, an associate professor in the Department of Earth Sciences and associate dean of the Clark Honors College, actively engages her students in the methods of scientific study and conducting research, often by including them in her own research projects. Her students have worked on projects ranging from data collection for a study on mammalian diet to collecting fossils in Eastern Oregon. Hopkins’s classes offer students “a virtual field trip into an exotic location, while giving them the opportunity to read and analyze current research,” said Terry Hunt, dean of the Clark Honors College. Voelker-Morris, a senior instructor of the Arts and Administration Program in the School of Architecture and Allied Arts, is known for continuously striving to improve student learning by connecting her students with various cultural communities. She teaches courses in arts and culture management as well as in comics and cartoon studies, first-year programs and common reading. Voelker-Morris invites students to explore “ways in which creative work and practice both enforce and challenge prevailing norms of and practices around significant social issues,” said Patricia Lambert, former director of the Arts and Administration Program. Williams Fellows receive $5,000 each and another $5,000 goes to help their departments bolster the undergraduate learning experience. In addition to the two Williams Fellows, seven instructional grants received funding. The Williams Council encourages proposals for instructional grants to develop courses that engage students in active learning. Past awards have ranged from $2,000 to $15,000. The Williams Fund for Undergraduate Education was established by Tom and Carol Williams to provide financial support for initiatives that enhance the quality of UO’s undergraduate experience. Proposals and nominations are reviewed by the Williams Council, which consists of the some of the university’s best teaching faculty.